Hello blog visitors, Kirsten here. I have another of the samples I made for the Event Day to show you. I used a piece of patterned paper from the CWC Time Flies collection & distressed it by spritzing both sides with water, crumpling it up a few times, then drying it a heat tool after I'd smoothed it out slightly. I used the blade of my scissors to distress the edges, then spritzed with a mix of water & gold mica powder. I painted the Wendy Vecchi Art Part watch part with copper acrylic paint & when it was dry applied a brown alcohol ink randomly on top. Gold alcohol ink was applied to the metal card, which I'd cut with a circle die, then I stamped the butterfly on top with Stazon ink. The seam binding was coloured with distress stain & dried with the heat tool while it was crumpled up, that leaves lots of creases in it. A few embellishments & a quote by Indigo Blu, stamped & heat set with clear embossing powder finished the piece. Thanks for looking, a quick reminder that the blog challenge ends at 10pm on Wednesday night. I'll be back on Thursday with a new challenge for August. Hi! 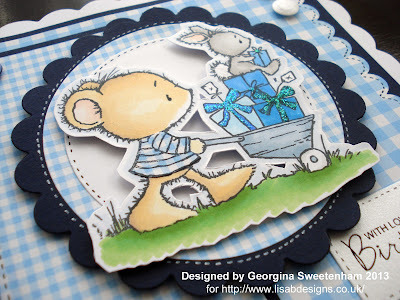 It's Georgina again with another sample card I made for Lisa's recent Craft Extravaganza day. The stamp I used for this card is the cute Wild Rose Studio Barrow of Presents. I stamped the image with a Tuxedo Black Memento ink pad onto smooth white card. I coloured the image with ProMarkers. Once coloured I cut around the edge of the image leaving a small white border. Using dies I cut a scalloped circle of blue card, and a circle of white card and of small gingham paper. 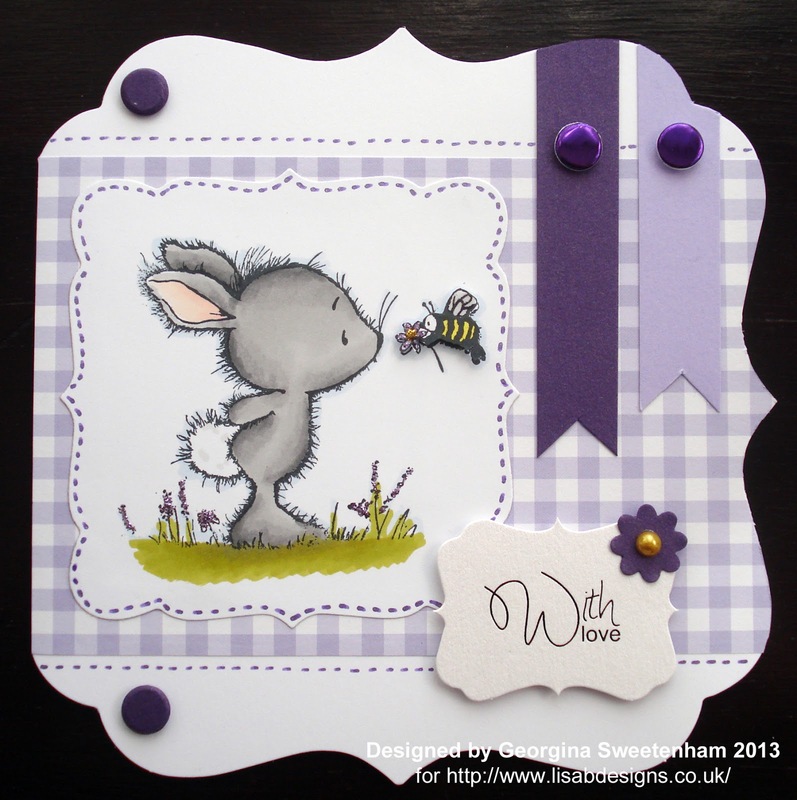 The gingham paper is from Wild Rose Studio Gorgeous Ginghams 6x6 paper pack. I attached all the circle together before adding the coloured image with foam pads. For the background I cut a piece of blue card. Onto this I attached a piece of blue large gingham paper again from the Wild Rose Studio Gorgeous Ginghams 6x6 paper pack. I had punched one edge of the gingham paper with a scalloped edge punch before attaching it to the card. I also cut a small piece of blue card and blue small gingham paper to create the side panel. I attached all the elements, and a sentiment, to a 148x148 white scalloped edge card blank. The image circle was attached with foam pads. To finish the card I added faux stitching, glitter glue to the presents and Candi. using my new favourite thing - Cosmic Shimmer Dries Clear glue. 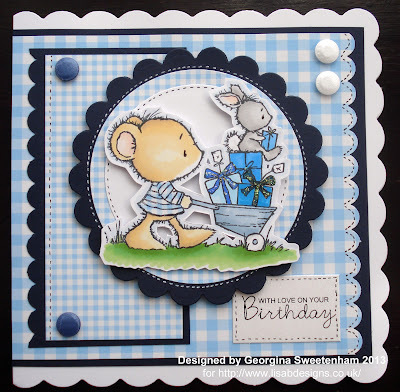 Welcome to my (Georgina) first post on Lisa.B.Designs Blog. For the next few Mondays and Thursdays I will be sharing with you some samples that I made for Lisa's recent Event Day. My card for today uses the cute Bunny and Bee Cling Rubber Stamp by Wild Rose Studio. It's such a lovely little image and can be used for so many different occasions. I started by attaching a panel of lilac gingham paper from Wild Rose Studio 6x6 Gorgeous Ginghams paper pack across a shaped card blank. I love gingham paper so a whole pack of it is just great! I stamped the image onto smooth white card using a Tuxedo Black Memento ink pad. 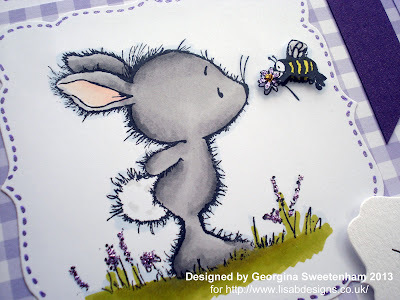 I also stamped just the bee again. I coloured the images with ProMarkers. I next die cut the coloured image and then cut out the little bee which I added to the main coloured image with foam pads. I added gold glitter to the centre of the bee's flower. Then I attached the coloured image panel to the card. 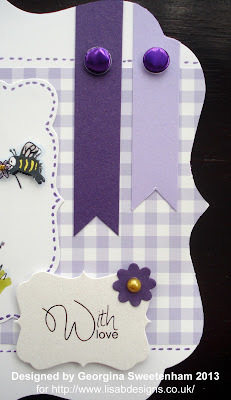 I cut a purple and a lilac flag shaped strip from coloured card and then attached these to the card and cut around the edge of the card where the flag strips went over the edge of the card. 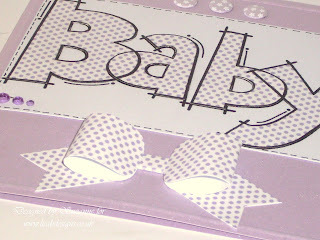 Using foam pads I added a Craftwork Cards die cut sentiment. I also added a small punched flower and yellow faux pearl to the corner of the sentiment. To finish the card I added Craftwork Cards Candi and faux stitching. Good morning, happy Tuesday, Kirsten here. I’ve got two of the samples I made for Lisa’s Craft Extravaganza day last Saturday to show you today. Saturday was a fun day for us & hopefully for everyone who attended too. 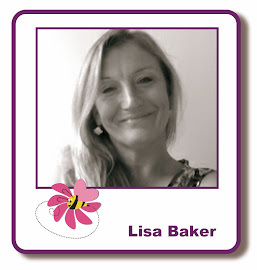 If you missed Lisa’s blog post about the day, you can read it HERE. 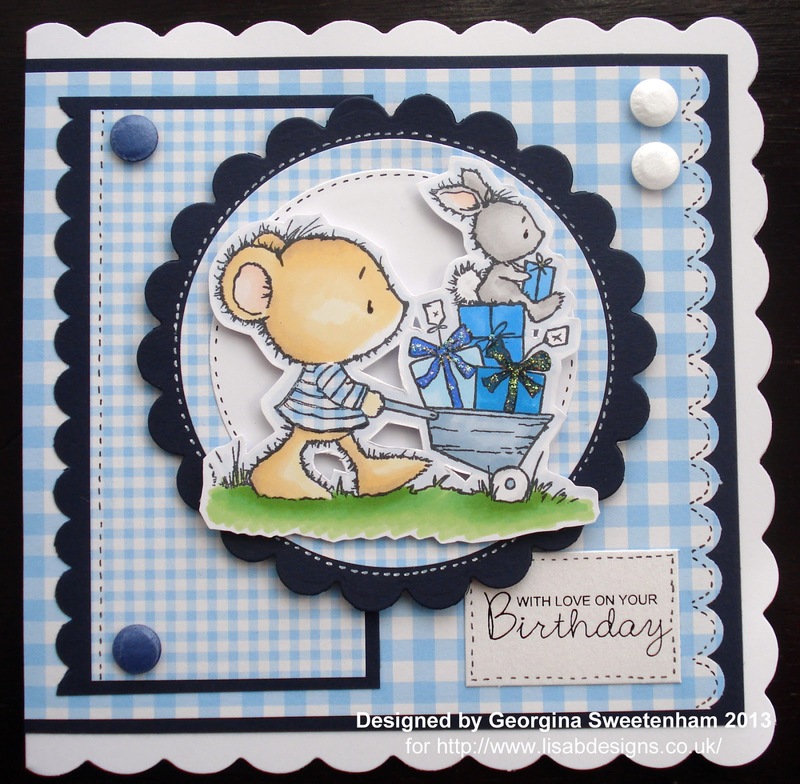 I used the Time Flies collection that Lisa designed for Craftwork Cards on both these projects. If you were at the event on Saturday you would have seen it, so you’ll know what a gorgeous collection it is. You can see it on the website HERE & Lisa will have it for sale at her next class, on Friday, August 2. I made this wall hanging first, the hearts are also from CWC. I had some of these bird cages & birds (also CWC), left over from previous projects so I added them, the Card Candi & the metal embellishment. Everything else is from the Time Flies collection. I wanted a quote, but also wanted the patterned paper to be visible, so I die cut a scallop circle out of acetate & stamped the Indigo Blu quote on it with Stazon ink. I used a Tando Creative mini printer tray for my next sample. As I’ve said in a previous post, the pieces of these trays are laser cut boards & the cutting process leaves a dusty residue on the edges, so you need to wipe them with a clean cloth, or a sheet of paper towel. I painted it with a Ranger’s paint dabber in Cool Peri. The butterflies, the bow & the backing paper are from the Time Flies collection & I just added a few embellishments. The glass vial is filled with embossing powder. So that’s it for today, we’ll all be showing you lots more samples over the next week or two. Don’t forget the blog challenge is still open, all the details are HERE. but can I firstly say a HUGE THANK YOU to everyone that came along and supported the day, it was a great success and we are already planning the 2014 Event! I thank you for your patience at the tills as I know the queues were very long and I assure you that we will have two tills in place next year! I also apologise for having to stop demoing so that I could help you get through the tills quicker and assure you that this will not happen next year as we have already made plans to sort that out and I will be there for you to pick my crafty brains all day next year, lol! It was lovely to see so many familiar faces but also a lot of new faces too and I know from what you have told me that you all loved the day. So much planning goes in to the day and it was so rewarding to get so many lovely comments from you all yesterday, you all made my exhaustion worth it by your comments. Suz and Jan on the till, you coped so well under pressure!! Kirsten and Rosemary on Make & Takes, everyone loved what they did and were proud of their achievements! My lovely family, Jo my sister and my niece Chloe on the catering side, Yummy!!! But Oh dear on the scales on Wednesday!! We will have a lot more savoury items along side the cakes as requested next year. My niece Heidi for running the Craft Raffle for Breast Cancer Care and the Tombola. Also well done to Carole Cheeseman for winning the yummy Breast Cancer Cake that my sister made. And lastly can I say another HUGE THANK YOU to the fabulous demonstrators and my lovely friends Julie Hickey from Craftwork Cards, Jenny Mayes from Hobby Art and Georgina Sweetenham. I did want to get a picture of them all together but we were too busy!!!! Well, this is really sounding like an Oscar Speech so I think it is time to sign off. I will be back soon next week with lots of lovely samples to show you.